by Saad Abdul-Kadir, Associated Press – Sunday April 24, 2011 at 10:05 AM ET. BAGHDAD, Iraq — At least seven people were injured when a bomb outside the entrance of a Baghdad church exploded on Easter Sunday, an Iraqi police official said. The blast took place just yards (meters) from the Sacred Heart Church in Baghdad's Karradah neighborhood. Shrapnel from the bomb struck the outside of the building, and at least four of the church's windows were shattered. Shards of broken glass lay on the street in front of the building. Like many Baghdad houses of worship, the church is surrounded by blast walls to protect it from such attacks. The officer said no parishioners were inside and services had not been held in the building. Four policemen and three civilian bystanders were wounded, said the official, who declined to be identified because he was not authorized to brief the media. Iraqi Christians have faced a recent wave of violence, including an attack last year against a Baghdad church that killed 68 people. Before Christmas services, al-Qaida-linked militants threatened a wave of violence against Christians, forcing many to tone down their ceremonies. There was no such threat ahead of this Easter Sunday but authorities nonetheless stepped up security in the capital and two main northern provinces where Christians live, tightening hundreds of checkpoints that already dot the streets and snarling traffic for hours. 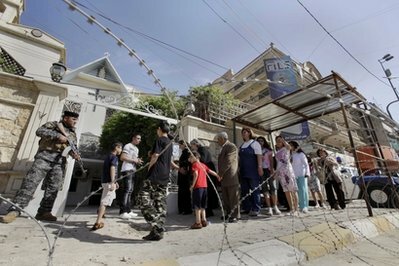 About 700 Christians attended Easter services at Baghdad's St. Joseph's Chaldean church where security forces closed off the roads leading to it, laid razor wires and searched all worshippers before entering the church. "Our life in Iraq is fill of fear," Father Hanna Saad Sirop told worshippers. "But we have to live in faith and trust ... we have to trust almighty God," Hanna added. Christians also marked Easter peacefully in the northern cities of Kirkuk and Mosul. Since the 2003 U.S.-led invasion, Iraqi Christians have suffered repeated violence and harassment from Sunni Muslim extremists who view them as infidels and agents of the West, forcing many of them to flee the country either to the safer northern Kurdish self-ruled region or abroad.